We arrived in Córdoba in plenty of time to find our chosen hostel full, and that the youth hostel was full too. We then tried a 2-star hotel across a little plaza from the youth hostel. They had a room and it was in our price range! The other two sides of the tiny plaza were a restaurant and the police station. We parked the bike beside the police station and covered it. We then went souvenir shopping. We are in the old town, again, and only a block from the Mezquita, the grandest Moorish Mosque ever built in Spain. The mosque was started in 756 about 30 years after the Moors crossed from Africa and conquered Christian Spain by Abd ar-Rahman I and completed in 796 by Hisham his son. The mosque was expanded and remodeled several times, nearly quintupling its size by 1002. It was first made by reusing marble columns from other structures mostly Roman. But the columns weren't tall enough so a pair of arches were added to the top raising the ceiling level. The arches were made by alternating red brickwork and white marble to make a very distinctive pattern instantly recognizable as this mosque. When it was finished it was described as having "as many bays as there are days of the year." It had 1293 marble columns and 280 chandeliers and 1440 lamps. Its grandeur rivaled that of mosques in Mecca and Jerusalem. The entrance was through a patio of orange trees and palms and through one of the many doors off the patio. The columns seemed to extend the tree filled patio to the indoors. 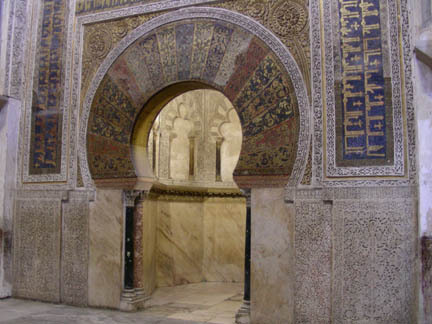 At the far side was the Mihrab, the equivalent to the pulpit/altar area in a Christian church and was designed to amplify the words of the prayer leader. This area was on the far side, the one closest to Mecca which is the holy city to Moslems. It is heavily decorated in gold mosaic patterns and script. The ceiling continues the pattern but the gold chandelier that used to hang on the chain is gone. Our audioguides (handheld listening devices) said that the overlapping arch design is unique. 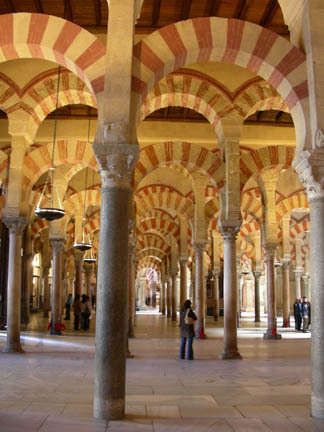 In 1236 Córdoba was captured by Fernando el Santo and the Mosque was converted into a Christian church. 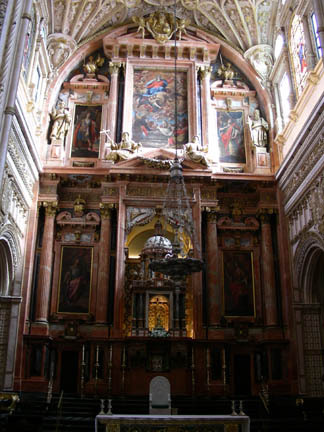 In 1523 a Renaissance church was built right in the middle of the mosque. A cross shaped section was torn down and the church was built there. This was done by Carlos V, remember him from the Alhambra, he's the guy that built that monstrosity of a castle in the middle of it. 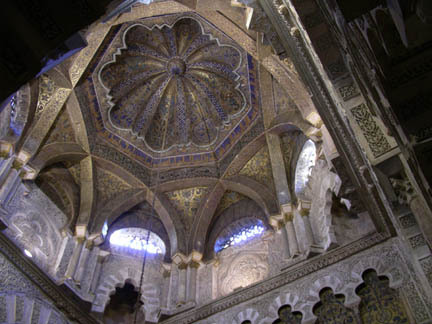 (He also destroyed parts of Seville's Alcazar, the Moorish palace there.) All around the sides of the building the bays were enclosed and Catholic chapels were built by various rich members of the church for their family's patron saint and to have a place to be buried. 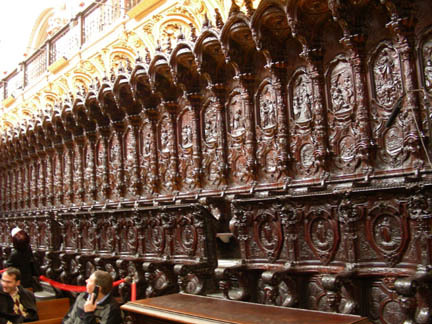 On the left is the altar and on the right the wonderfully carved seats of the choir. After two nights here we head toward home with one more stop. The hotel had a brochure for a 14th C. castle in a town called Almodóvar del Río that is on the way home. 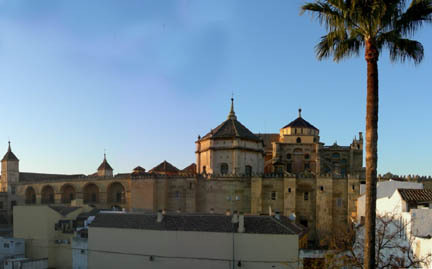 It is about 30 minutes from Córdoba and we stop of to see it.